Pliny the Elder coined the term “Geomancy” in the first century AD. My own work in the field of geomancy is largely through dowsing – also known as” divining” in Iceland. I do not dowse with a forked stick, but with two L- shaped metal rods in the field and using a pendulum over maps. I use them to detect energy patterns in the landscape. The basic principles of earth energy patterns are quite simple. There are underground streams that carry energy flows. They mostly carry charged water, but may contain gases or mineral lodes. They are sinuous. Where two undergrounds cross a spiral of energy rises to the surface. 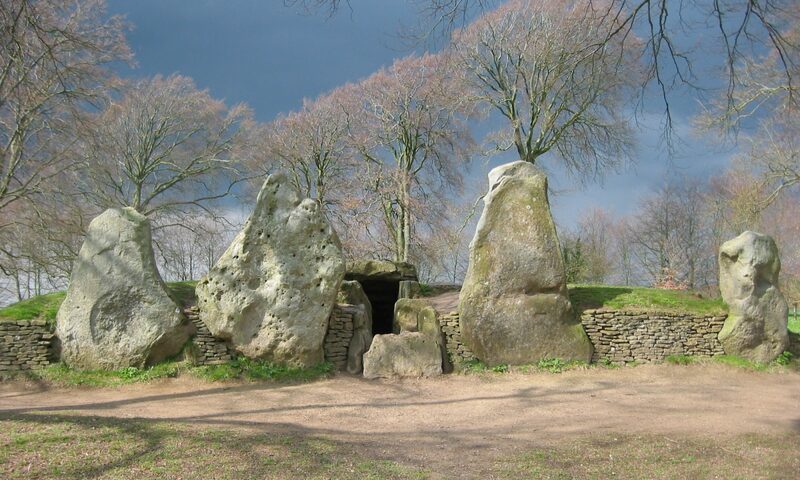 Megalithic culture put stone circles on many of these locations. Stone mediates the energy and enhances an ambient atmosphere for human use. The second basic element is straight lines travelling over the surface of the earth, which can be as narrow as two feet and as large as half a mile wide. Dowsers call them “energy leys”. They form webs on the landscape. Both types of line carry frequencies that can affect human health and awareness. I define the quality of energy by colour. Until recently their predominant colours were in the spectrum of the rainbow, but now other frequencies gold, silver, pink, brown and purple are becoming common. The original frequencies can be removed by iron and steel, and disrupted by high electrical voltages, radio, T.V. and microwave transmitters. The new ones are not. When lines are malfunctioning, they dowse as black. They can induce disease and negative emotion. If we look at Drombeg, you will see the energy pattern of a major ancient sacred site. First, you can see four underground streams crossing (diagram 1). In the next diagram you can see the major energy leys focused by the site. At present, there are seven energy leys crossing the Drombeg circle, but they are too interwoven to show in a diagram of the site itself. The diagram shows the larger lines associated with the site. For me, the energy lines have a similarity to acupuncture meridians in the human body. The energy associated with sites such as Drombeg form the larger energy lines of the country’s system. Between the major sites, smaller patterns of energy move over the earth’s surface, energised by the major lines. They are not just features of ancient sites, they exist all over ‘the earth’s surface, some even cross oceans, though most energy leys do not cross. The influence of Drombeg reaches as far as the Dingle Peninsula in the summer months, when the energy leys are strongest. The tip of the Mizen Head Peninsula has a very distinct energy pattern. I believe this is because it is mostly, surrounded by water and has very little modern development. In other areas, work with diggers could break energy leys miles away and destroy the pattern, but this one has been preserved by its coastal nature. It appears that the strong pattern here enables a line to cross the Atlantic. Just below where it leaves, there are derelict copper mines. It seems that the copper lode strengthens the line so that it can span a great distance. In summary, I believe that the earth’s energy field was known and used by old civilisations. It still exists and affects us. I also believe we have to recognise it in any future land use. Dowsers have been working to remedy site problems on a case by case basis for at least 50 years, but I have no sight of an overview in any dowsing literature. Wonderfully detailed studies of multiple energy bands, different directions of flow, and seasonal fluctuations have been made by highly competent dowsers to extend their studies through map dowsing. This produces an overview of a system. I have been using this technique for five years and have observed several recurring features. At first, I anticipated finding geometric patterns in energy leys, but I have only found them on the Mizen Head, in Co. Cork. I do not dowse for grids, but I have found several energy leys that follow a north/south direction. I have also studied four megalithic sites which have displayed a common feature – which is two underground streams interweaving – reminiscent of the Rod of caduceus, the symbol of healing used by conventional medicine, whose origins lie in Hermetic tradition.